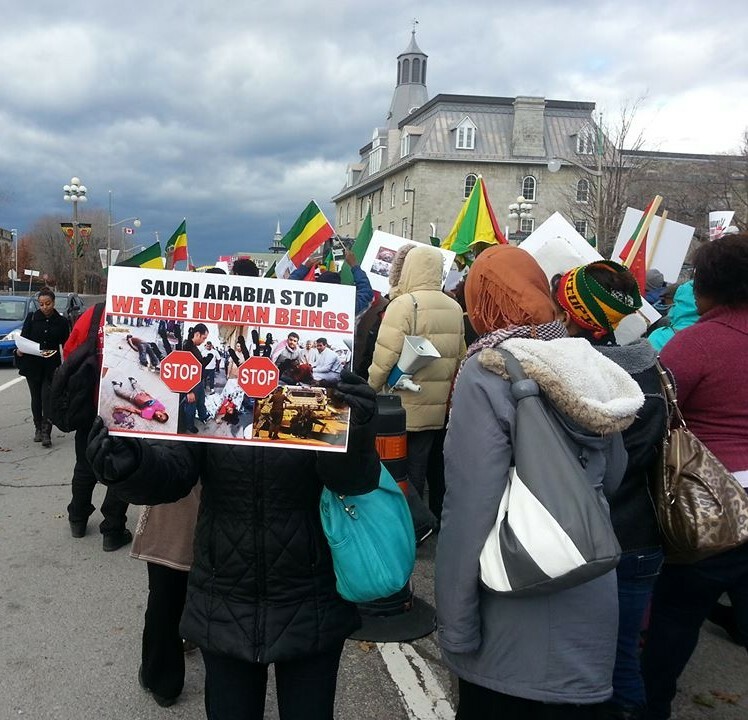 Around 250 people marched from Parliament Hill to the Saudi Arabian embassy on Nov. 18, to peacefully protest alleged human rights abuses against Ethiopian migrant workers in Saudi Arabia. The protesters say Ethiopian migrant workers in Saudi Arabia are being rounded up and put into concentration camps where they are being tortured, beaten, and raped. Saudi Arabian authorities have been clamping down on illegal migrant workers since early November. Saudi authorities say they are trying to reduce the 12 per cent unemployment rate among native Saudis, according to reports from BBC News. This has led to the removal of illegal migrant workers from the country. “The country has the right to hoard illegal immigrants, we’re not saying that they are wrong or anything, but everyone has to be treated like a human being,” said protest co-coordinator, Yodit. “Saudi Arabia agrees to the UN human rights. The country is on the United Nations Human Rights Council, so if they are doing that they should abide by those rules,” Yodit said. “As a human being, no one should subject anyone to that kind of treatment,” said Eshete, who took part in the protest. Ganamo, a member of Ottawa’s Oromo community, an Ethiopian ethnic group, said many of these Ethiopians have been working as migrant workers in Saudi Arabia for several years. The protesters say they decided to march in Ottawa to raise public awareness and to get the attention of the Canadian government and ambassadors within the Saudi Arabian embassy. “We just want people to be aware of the violence that is happening in Saudi Arabia and we want it to stop,” says Hiwot, a supporter of the protest. 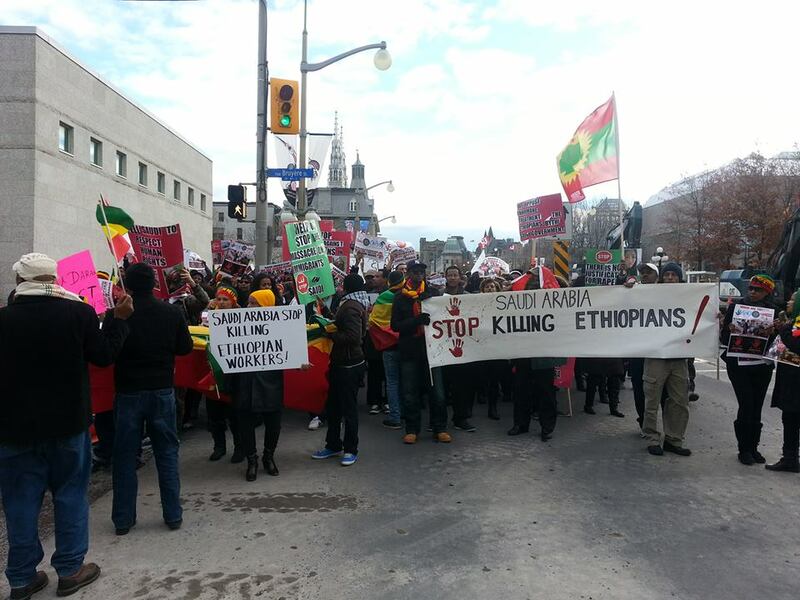 Ganamo said the issue affects more than just the Ethiopian community, and that Canada should denounce the human rights violations happening in Saudi Arabia. “[There are] other ethnic groups, other migrant workers who are from other countries who are residing in Saudi Arabia. This should be an international issue,” Ganamo said. Demonstrations erupted across North American and Europe last week in protest of the abuse. Saudi police clashed with workers in early November after authorities began rounding up migrant workers who failed to provide proper work permits. More than 16, 000 Ethiopian migrant workers have been repatriated, according to Al Jazeera America.